The ability of individuals and organisations to learn from experience is essential if they are seeking to achieve continuous improvement in their practice. This simple truth is one that many in the field of child safeguarding appear reluctant to accept. When a tragedy occurs, inquiries frequently reveal an inability on the part of the organisation to learn lessons from the past and apply these to their present practice. Given that this is the case, it is important that those involved in leading organisations that provide services to children, breakdown the stages involved in drawing learning from past experiences, and examine whether their performance in this area is adequate. This approach has particular relevance to any organisation that has had a poor record in responding to risk to children. Through its adoption, you are provided with a conceptual framework that helps you to look critically at your performance and answer those critical questions around what needs to change in the future. 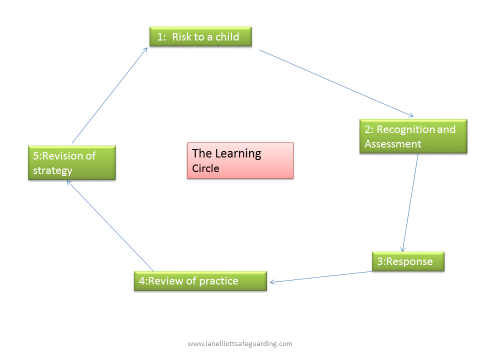 The name that I have given to the framework that I use is “The Learning Circle”. Quite simply what it seeks to do is to identify the stages in the journey that anyone who is involved in child safeguarding practice has to make if they wish to draw learning from the experiences that they or the organisation in which they practice, has had. The inability to learn from experience is quite rightly the subject of sharp criticism when it is discovered. To err is to be human but to repeat the errors is unacceptable. To understand why this is happening is an essential first step in preventing it happening again. The process of safeguarding children begins with the existence of risk, which leads on to the recognition of that risk, the response to it, followed by a review of the practice involved. Finally, the strategy for safeguarding is revised in the light of the experience gained. This framework is simplified here to place emphasis on the cyclical nature of the process and the fact that each stage should be approached sequentially for it to be successful. It is valuable for anyone engaged in safeguarding children to consider how well the organisation that they practice within performs in each of these stages. Most will place an emphasis on the first three stages of “risk, recognition, and response” with little or no attempt to reflect on their practice or consider ways in which it can be improved. As a consequence, they fail to draw on the rich learning that can be gained from doing so. They also run the risk of repeating errors in the future because they have not sought to learn from their mistakes. Many large organisations that provide services to children and who have a poor record in responding to abuse, fall into this grouping. The Catholic Church in Ireland is just one example where repeated experiences of abuse were not learned from and the mistakes that facilitated the abuse occurring, were repeated a number of times as a result. Given that the need to critically reflect on practice is an essential stage in linking experience to improvement, the adoption of a sound mechanism for achieving this is critical. I have written previously of the importance of a standards based, independent review process within all organisations that provide services to children. (The Critical Importance of Safeguarding Reviews – Blog Post March 2013) Within this framework of “The Learning Circle”, it is the means by which you can pass from stage 3 along to stages 4 and 5. Without it, you run the risk of not linking experience gained to improvement achieved. The performance of an organisation involved in safeguarding children can be assessed by reference to the 5 stages of the framework. You should examine each stage and consider how well your practice matches up to what may be expected of a competent performer in this area. For example, how well is risk recognised by those in contact with children? How informed are they with regard to the presentation of an abused child or the behaviours that should give rise to concern? When these are seen how well are they responded to? Are the appropriate steps taken quickly and effectively? When a concern is recognised and responded to, is there any attempt made to reflect on the way in which the situation was managed after the event and does this lead to any change in the way in which the organisation will seek to respond in the future? For the organisation or individuals within it to achieve full learning from experience, these stages need to be explicit. The process that is described here is an iterative one with five distinct stages. You pass sequentially from each stage to the next drawing and applying learning as you complete the journey. 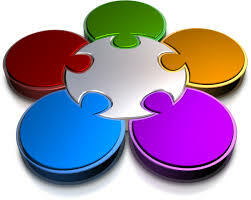 So much of the effort that safeguarding organisations expend is focused on the first three stages with little or no effort at completing the circle. This failure can contribute to a feeling of being stuck. Mistakes are repeated which give rise to feelings of despair and hopelessness. People in this situation want to stop the slide into further bad practice but lack the means by which they can achieve this. The adoption of this 5 stage model will help to stem that slide and refocus attention back on drawing learning from past mistakes so that present and future practice can be better. The more that you become familiar with the model proposed here and apply it, the greater the results will be. Organisations will ask questions of themselves that they would normally face within an inquiry situation following a serious incident of abuse. This provides them with the opportunity to implement improvements in their practice that will lead to the prevention of further serious incidents occurring in the future. It also means that they can do this without experiencing the full glare of public scrutiny. The conceptual framework that I have outlined here is easy to follow. However, for it to be successful it requires a willingness on the part of the individual or the organisation to be open to examination and criticism. To learn from mistakes made requires that they should be accepted as having been made in the first place. A focus on diverting criticism to others is unhelpful. Be willing to honestly look at practice and consider ways in which it can be improved is what is aimed for. The availability of an independent reviewer is very helpful to this process, and many organisations have made active use of one and gained greatly from it. What I have sought to do in this short paper is to outline the conceptual framework that I have used in attempting to learn from experience in my safeguarding practice. It is not new and in developing it I have drawn from many sources. It can be employed by an individual practitioner or by an organisation who has an interest in improving their performance. Adapt it to meet your own needs as you see fit. What it must do is to provide you with a means by which you can actively apply learning gained from reflective practice to future actions. If you do this I believe that it will bear rich rewards for you as it has done for me.